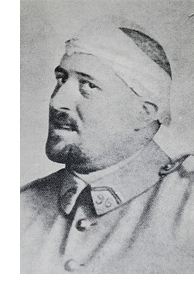 Apollinaire officially took French citizenship at the outset of the War. He joined the French army near the beginning of the war, and trained in artillery, before being made a second lieutenant in the infantry. In 1916 was wounded in the head by shrapnel. He never fully recovered from this wound (or from the two operations he had to go through) and, weakened, fell victim to the Spanish Flu epidemic, dying two days before the Armistice, on 9 November 1918. As yet I have no further details. I have relied in part on H. Allorge’s entry in the Dictionnaire de Biographie Française, vol. 3 (Paris, 1939), 122-124.